A patchwork group autobiography by the noted New Orleans musicians. Blame it, perhaps, on the recent craze for oral histories: rather than write a straightforward narrative of the Neville Brothers' inarguably influential musical career, as he did with his fine life of Marvin Gaye (Divided Soul, 1985), music journalist David Ritz organizes this text in snippets, with each of the four brothers speaking more or less in turn to document their five decades' work. The brothers are markedly different: Artie, the eldest, has passions for technology, doowop, and science fiction; Charles, the next oldest, is a jazz aficionado; Aaron, an ex-junkie and would-be cowboy, brings a sweet tremulous voice to just about any kind of music that can be made; and Cyril, the baby brother at 51, is a master of polyrhythmic percussion and, in his off time, a voracious reader. To judge by this account, Charles is the great talker of the family, although all the brothers spin out fragmentary, sometimes unfinished stories that touch on old wounds, the costs of fame, the pains of growing up in the segregated South, life in prison (where a couple of the brothers spent time), and (in more detail than one might like) their sexual conquests. On a more upbeat note, the brothers also talk about healing the rifts that once existed between them as they struggled to carve out careers, individually and together. As they talk, the four are clearly aware of their key roles in having introduced zydeco, New Orleans soul, and other regional forms of music to an international audience, but they are generous in showering praise on fellow musicians with whom they've shared stages—among them Dr. John, Ray Charles, James Brown, Jimi Hendrix, and Linda Ronstadt. 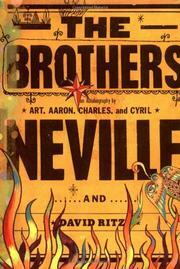 Loyal fans of the Neville Brothers will likely enjoy this book, disjointed though it is.